Sometimes in the spiritual life it can seem as if we are going backwards and almost moving away from God instead of growing closer to him. When you read about the lives of the Saints, they often experienced the "Dark Night of the Soul". Some of them even questioned their own salvation during those times. 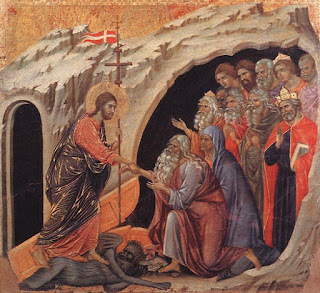 Yesterday was Holy Saturday and I was thinking about Jesus descending into hell and the abode of the dead. I think, in a sense he allowed me to visit that place this Lent as well. Lent didn't go the way I had desired or planned. I wasn't always faithful to my Lenten promises to read my bible and pray the Liturgy of the Hours every day. God in his sovereignty however had his way with me. Instead of being able to do lots of Pius acts, I dealt with one sickness after another with myself and my children. That was normal life however and not too difficult to handle. What proved to be very challenging though was not knowing how to parent one of my children who suffers from extreme sensitivity and anxiety. I have been crying out to the Lord for a long time to help me be a better mother. For whatever reason, my own mom wasn't able to nurture or show much affection towards me unless I was sick. She was a nurse, so she knew how to take care of sick people. Needless to say, that can create a little bit of dysfunction. So, knowing how to be a nurturing, affectionate mother hasn't always come naturally for me. Sometimes it is through the extreme circumstances that we learn things. Kind of like when you are pushed out of an airplane with a parachute on. Hopefully, you will figure out how to pull the parachute so you can fly instead of die. Likewise, sometimes you need to descend into the depths of hell before you can rise and overcome. This Lent I faced the accuser. He spewed hateful, vile and hurtful things at me. There were situations that made me want to pluck my eyes out. It probably would have been less painful! In the midst of it all, I had to learn how not to react and eventually rise above it. It was through the confessional one day, I was told I needed to see myself as holy. I was told as my penance to pray the Magnificat. I have read that scripture many times but I always just saw it as Mary's prayer. I never saw that I could claim it for myself. Well, after it was given to me as my penance and in light of the priest telling me I needed to see that I was holy, I began to see that I could claim this prayer for myself. I began to hold my head up high and face my accuser. The joy it gave me is indescribable! Since then, the grace has been there with my children and especially the one that suffers from anxiety. There has still been difficult situations but I have not gotten frustrated. Instead an abundance of patience and kindness has been there. So, going back to what I said in the beginning, sometimes you have to go down before you can go up but then once you go back up, you end up in a higher place if you persevere and don't give up. We are only as virtuous as we are in the worst of circumstances. Difficulties can often show us what we are made of. Sometimes it is the worst of circumstances that can end up bringing out the best in us. 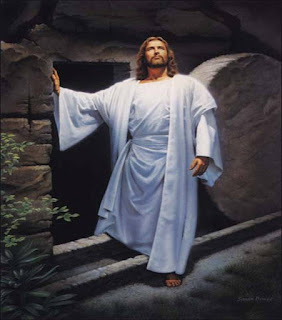 This Easter, let us rejoice that through the power of the cross and Resurrection of Jesus, we can overcome!